After the successful installation you can proceed to the configuration. In Magento admin go to creativestyle ‣ Login and Pay with Amazon ‣ Settings (or System ‣ Configuration ‣ Amazon Payments tab). In this section you can define your Amazon Payments seller account credentials. Fill out those fields with your Amazon Payments seller credentials. You can find them in the Amazon Seller Central, see: Where to find the required credentials to configure the Magento extension. Select the country where you registered your seller account from the provided drop-down list. If you’re unsure about this information consult your Amazon Integration Assistant. This button is designed to validate your Amazon Payments account credentials. Please use it to check whether your credentials (Merchant ID, Access Key ID, Secret Access Key and Marketplace) are valid or not. Please note that the above feature will validate ANY Amazon MWS account, also such one that is not registered to Amazon Payments. In this section you can enable or disable the Pay with Amazon service and define basic settings of the extension. By switching this option you can enable or disable Pay with Amazon. This option must be set to Yes if you want to provide the Pay with Amazon service to your customers. Sandbox mode has been designed to test the Pay with Amazon service. In sandbox mode the selected payment method is not charged. Refer to the Pay with Amazon documentation to get more information about the sandbox environment. In general, sandbox mode should be enabled for development and staging environments for testing and always has to be disabled for production environments. Never show the sandbox buttons and widgets to buyers in your live environment. In sandbox mode you can simulate certain states for the different objects in the payment process. By enabling this option you get additional fields on the Amazon Checkout page that allow selecting expected payment statuses for orders, authorizations, captures and refunds returned in responses. This feature allows you to simulate different scenarios including declines in the sandbox environment. Manual authorization - the order reference is created only. Authorization must be requested manually by clicking Authorize button on the order preview page in Magento admin. 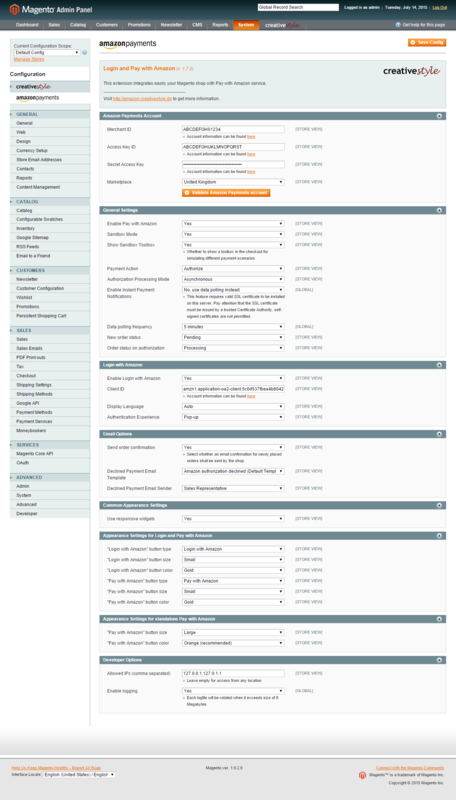 Authorize (default) - order reference creation is followed by automatic authorization request. 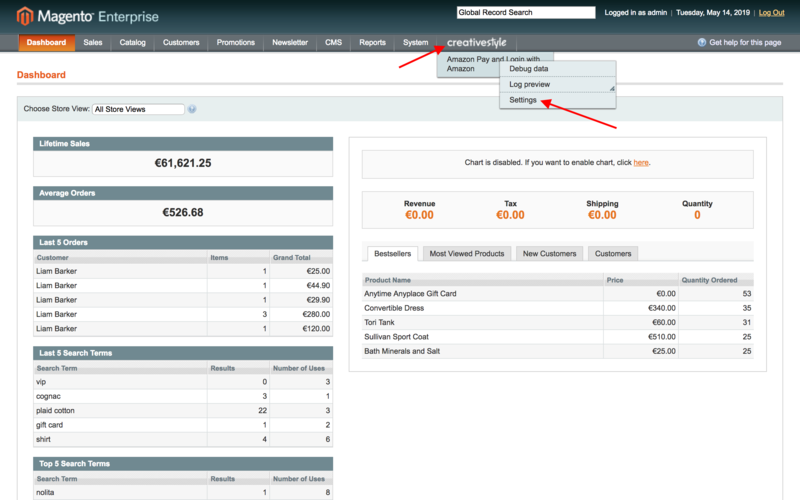 Capture must be requested manually by creating an invoice with Capture online option selected. Authorize & capture - order reference creation is followed by automatic authorization and capture request. It is mandatory that you get white-listed for this feature by Amazon Payments first. Do not activate this option without contacting Amazon Payments first. ERP mode - same as Manual authorization , but further payment processing (authorization, capture, IPN notifications handling) is blocked in Magento. In this mode, it is assumed that after order reference creation rest of the payment processing steps will be handled by merchant’s external ERP system. Please use Authorize & capture method only in case you are shipping goods on the same day they are ordered and you have been white-listed for this service. Please do not use ERP mode unless your ERP system supports Amazon Payments transactions processing. This option defines mode of calling authorization request. By default Asynchronous mode is set, meaning that the Amazon Payments API responses immediately, but the authorization status is not known exactly and thus returned as Pending. This behavior requires authorization status update (either via IPN notification or cron-triggered data polling) before dispatching the order. Synchronous authorization returns its status immediately, but such a process takes usually few seconds more than Asynchronous authorization, causing your customer needs to wait longer until success page appears after Place order button click. This option enables or disables handling of Instant Payment Notifications, which are used by Amazon Payments for sending feedback concerning the status of payment objects. Keep in mind that using IPN requires valid SSL certificate (issued by a trusted CA) installed on your server and correctly configured Secure Base URL and Use Secure URLs in Frontend config options (System ‣ Configuration ‣ Web ‣ Secure section). In case you disable IPN and want to use data polling instead you need to setup a cron for your shop. Trusted Certificate Authorities and other SSL requirements are listed on Amazon Payments webpage in english and german language. This auto-generated value shall be entered in the Merchant URL field of the Integration Settings in your Amazon Seller Central in case you plan to use IPN. If you use more than one store view in your Magento installation, the IPN endpoint URL will be shown after selecting appropriate store view scope. If you don’t have a valid SSL certificate in your shop or due to any other reason you don’t want to use IPN, you can set how often status of the different object shall be polled from Amazon Payments servers. Note that the cron must be setup for your shop for periodic triggering routines that poll payment data. With this option you can choose the status for newly created orders. Statuses assigned to New state are allowed only. Please note that this config option becomes obsolete when you use synchronous authorization, initial order status will be set to Order status on authorization value then. With this option you can change the status that will be set for an order after a successful authorization. Statuses assigned to Processing state are allowed only. In most cases leaving the default value seems to be a good idea. Please note the difference between state and status terms in Magento. State is used by Magento internally to identify current stage of the order workflow, while status is some kind of a descriptive reflection of the state for seller purposes. Just as it is not possbile to define custom states in Magento, it is not possible to configure the extension to use different order states as well (New aka Pending is used for newly created orders, Processing - for successfully authorized orders). This rule implies that New order status can be only changed to the status that is assigned to New state, while Order status on authorization to the status assigned to Processing state. Any attempt to modify this behavior in the extension source code directly may lead to the inconsistency of the order workflow and may cause hard to debug issues. In case you need different than New state for the newly created order, consider using synchronous authorization which gets authorization status immediately and uses Order status on authorization straight away. In this section you can configure Login with Amazon service. By switching this option you can enable or disable Login with Amazon feature. This service must be enabled if you want to create customer accounts in your Magento shop when order is placed and to make sure that any of the orders paid with Pay with Amazon will be never a guest order. The Client ID identifies your website for Login with Amazon service. Please refer to Where to find the required credentials to configure the Magento extension section to find out how to get the value of your Client ID. In this option you can select a language which will be used for displaying all elements (froms, widgets) generated by Amazon Payments. Selected language will be also used to localize emails sent by Amazon Payments to the customer after purchase. This setting applies also to Pay with Amazon as long as Login with Amazon is enabled. Select the method the authentication will be processed. By default Pop-up is used, meaning that after pressing Pay or Login with Amazon button, new window with Amazon login form opens, this requires the page you are placing the buttons on to be SSL-secured though. Choosing Redirect experience your customers will be redirected to Amazon login form in the current window after pressing Pay or Login with Amazon button. For the Redirect experience it is required to set Allowed Return URLs in the Login with Amazon section in your Seller Central. Be aware that Pop-up authentication experience used by default requires the page, the button is placed on, to be in the SSL mode. This requirement is fulfilled by switching the cart page into SSL on the fly. This may lead to the unexpected results, especially if you are using some non-default Magento extensions (eg. AJAX-based adding to cart). It is always advised to test the extension in the staging environment prior to the production deployment. This option allows you to select whether a confirmation email for newly placed orders shall be sent by the shop. Note that, regardless this setting, a payment confirmation will be always sent by Amazon Payments. Order confirmation emails are not sent unless authorization is confirmed. If the emails are not sent, even you have above option enabled, it is very likely that Amazon Payments transactions are not updated. In such a case please make sure your shop accepts IPN notifications or polls transaction data in the cronjob. In this option you can select an email template which will be used for notifying customers about declined authorizations. Refer to the Email templates section to find out how to customize email templates. With this option you can define the sender of the Authorization declined email notification. The sender can be selected from the pre-defined Magento email contacts (System ‣ Configuration ‣ Store Email Addresses). In this section you can set size (width and height) of Amazon widgets used in the checkout process. With this option you can decide if Amazon widgets used in the checkout (address book, wallet) will adapt to the layout by filling whole container area. This behavior allows to set widget size by defining size of its container in the external CSS file, making Amazon checkout compatible and easy to use with responsive layouts. Disabling this option will change the widgets to use explicit sizes defined in the next config options of this section. In this option you can set size in pixels (width and height) of Amazon address book widget for disabled Use responsive widgets option. In this option you can set size in pixels (width and height) of Amazon wallet widget for disabled Use responsive widgets option. These settings apply to the design (type, size and color) of the buttons, both Pay with Amazon and Login with Amazon , when Enable Login with Amazon option is set to Yes , therefore they become irrelevant if you don’t use Login with Amazon service, you may be interested then in Appearance Settings for standalone Pay with Amazon. These settings apply to the design (size and color) of the Pay with Amazon button when Enable Login with Amazon option is set to No , therefore they become irrelevant if you use Login with Amazon service, Appearance Settings for Login and Pay with Amazon are applied then. For testing or debugging purposes you can restrict access to Pay with Amazon checkout in your shop to certain IP numbers only. Pay with Amazon button will be shown only for the visitors coming from allowed IPs. You can set more than one allowed IP separated with commas. The Pay with Amazon extension comes with a dedicated logging mechanism. Any exception, API call or IPN notification will be saved to the var/log/amazonpayments folder in your Magento installation. For your convenience logs are also accessible via creativestyle ‣ Login and Pay with Amazon ‣ Log preview in Magento admin. Refer to the Event logs section to get more details concerning the logging feature.